In January 2004 our LNER TPO set (70268E and 70294E) was retired after some 22 years service on the Great Central. During this time these vehicles have provided many spectacular mail exchanges at Quorn with a wide variety of locomotives. It has enabled us to demonstrate this important piece of lost railway operation and provided many thousands with one of railway preservations most spectacular sights. 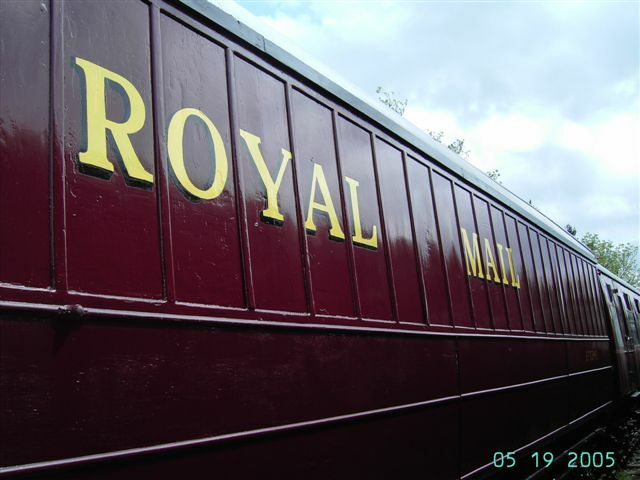 The Tender vehicle also houses our award winning museum of postal items. mail exchanges run at a higher speed than usual on preseved railways and the pounding was beginning to show on these historically important unique vehicles. The decision was therefore taken to stop the set after the gala for around 12 months. This was for a program of heavy maintenace with the intention of returning it to service in 2005 for a further period. 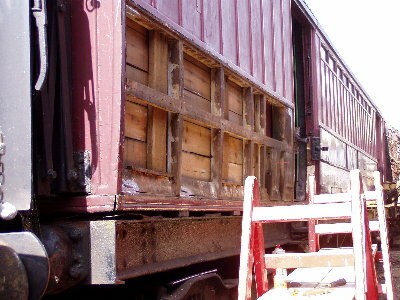 This work is not intended to be a full restoration (which would take many years with volunteer labour), but is to prevent deterioration and ensure the vehicles remain safe to operate. This page provides details of the work carried out, which is mainly centred around our 2004 work week in April. However it is expected that the work will take rather longer than a week to complete so this page will continue to chronicle progress until the set returns to service. WE NEED DONATIONS!! - This work is being financed by donations from our members and the the general public. These are very important vehicles - the only pre-nationalisation TPO sorter/tender pair and the only sorter fitted with working exchange equipment in preservation. PRIOR TO WORK WEEK - Top priority was repainting the tender roof, which has been leaking badly. The canvas is in very poor condition and will need totally replacement (probably within 3 years), but for the time being it has been given a coat of Acrylic roof sealant. This has proved to relatively succesful. Some small leaks remain so patch painting wil continue until it is cured. 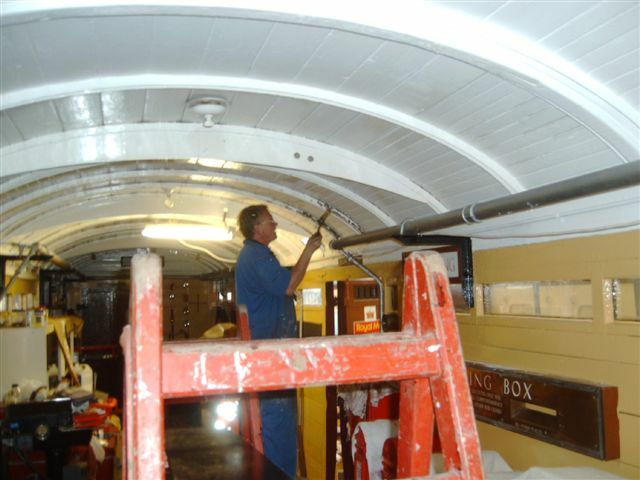 Meanwhile work started inside the tender on putting the damage caused by water ingress to rights. On the sorter, the exchange uquipment has been removed for inspection of the woodwork behind and overhaul of the equipment. Happily the woodwork has proved to be sign, but some damage to the exchange equipment need rectification before refitting. Picture HERE shows the door way with the equipment gone. WORK WEEK DAY 1 - The sorter has had a coat of lead roof paint. This roof remains in good condition and should be OK for many years. In the tender work on the interior continues, Nev painting the ceiling . Outside new carpenter Pete, assisted by Norman seal and refix loose panelling. Down theyard "old" carpenter MIck (with apologies!) proves a square peg does go into a round hole. I've no idea what he was doing but it was connected with building a new work bench in our CCT that is to become the wood working shop. DAY 2 - The sorter saw continued activity on its roof, with the cantrails sanded and primed. Work then started on the West side with a heavy sand - picture. This involved taking any damaged paintwork back to bare wood and then priming. The rest of the bodyside was given a lighter sand to provide a key for the new paint. Elsewhere work continued on turning our CCT into a wood shop, and we also helped unload the wood for the Beavertail roof. DAY 3 - The sanding of the sorter continued, until the arrival of the heavy rain that truned out to be in for the next three days. Work therefore went indoors with the BZ floor receiving a coat of paint - picture. The cupboard was later fixed into position and a few other finishing touches added to complete the interior.In the CCT the lighting was put in place to allow our carpenter to see what he is doing. New beading for the tender was also given a coat of primer for fitting at a later date. DAY 4 - A brief pause in the rain saw the rotten sorter toilet "window" replaced (I say window but it is actually a sheet of steel - a mod made in BR days). The window is nearest in this picture. With the rain still coming effort was transferred to the exchange equipment. This was taken into the shed for cleaning and then given a coat of primer. Pictures here and here. This picture shows the main assembley that surround the base of the doorways with the heavy castings that the traductor arms rest in either side. Happily there is no major damage to these or the frame work that holds them, but some welding work is required (any volunteers??). Work also continued on the interior of the Tender. In the evening work stopped and we moved to the "Rose and Crown" at Zouch for Brian Green's retirement meal. As ever the food was excellent and presentations were made to Brian in the form of a framed photo of "St George" (If you know Brian you'll know why! ), framed photo of the TPO crew, two engraved wine glasses, a cover off the final main line TPO and (last but not least) a Beavertail mug..
DAY 5 - Starting the day with a barbeque the rain then stopped. The delayed work on the sorter could then resume in earnest, with the result that by the afternoon we had a pink sorter after its coat of undercoat. DAY 6 - The gloss coat went on the East side of the sorter, and some mechanical work on the BZ was completed to breing the work week to a close. 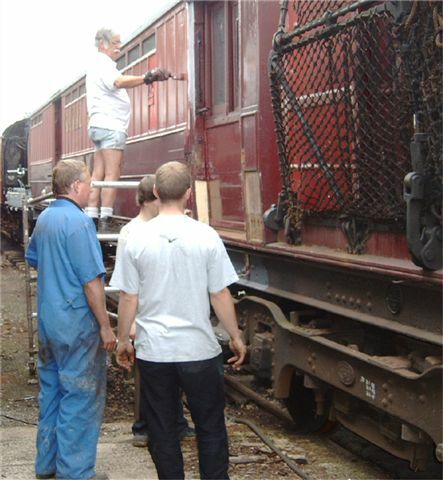 UPDATE - 3rd AUGUST 2004 -Work on the vehicles has continued at a steady rate since the workweek. Sorter 70294E has seen the very rotten steel panel behind the net completely renewed, work on the exchange equipment concluded (ready for refitting), and the centre door on the West side has received attention. At the time of writing the sanding and repainting of the East side is in progress, and new panels for the lower section will be prepared in the next two weeks. This photo shows repainting in progress while a committee meeting takes place! On the tender, 70268E, work on the interior has continued apace, and attention is now being focussed on the damaged exterior panelling. The brake cylinders have been removed and overhauled (with thanks to Loughborough loco shed for doing the necessary machining). Next priority for this vehicle is to fit a new roof canvas - work which is scheduled for September and requires a massive volunteer effort - please offer to help if you can spare any time. 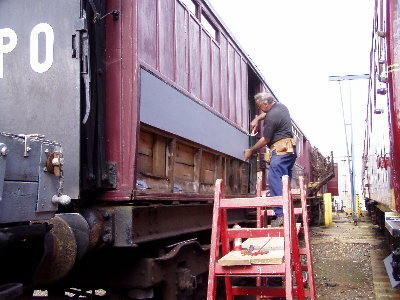 UPDATE - 11th SEPTEMBER 2004 - Work has now started on the repanelling of the lower east side of the sorter. The new panels had been prepared over previous weeks so the first job was to remove the old panelling and beading leaving the frame exposed. The metal brackets can then have the rust removed and a coat of protective paint before the first of the new panels can be fitted in place. The other panel can then be fitted and the light fitting fixed to the completed panelling. All that remains now is to fit the beading and painting to complete this section (then repeat another 4 times!). Meanwhile on the Tender the monday group have been doing much the same although the work on this vehicle has been a little more extensive due to more severe corrosion on some of the brackets requiring their replacement. Photo. 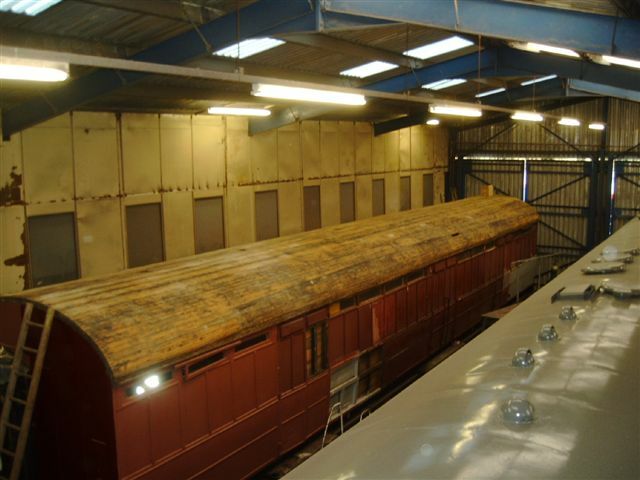 UPDATE - 20th SEPTEMBER 2004 - The tender has now moved into the shed as planned - and work on the re-covering of the roof started swiftly. The old canvas was removed relatively easily, this photo shows the cleared roof. The boarding is generally in good condition with just a couple of small areas needing renewal. From inside the vehicle the screws holding the boards on have to be knocked out where the boards have started to spring away from the retaining hoops. This is a particularly awkward job in this case as the screws used are countersunk (and rusted)into the hoop giving little choice but to hammer them until they break free. Once these screws are out the boards will then be bolted back down. Meanwhile the opportunity is being taken to renew the exterior panelling while in the dry shed. UPDATE - 18th OCTOBER 2004 - The roof work continues apace. Old screws have been removed and the boards pulled back down by new bolts , pictures here and here. Work on sanding the roof has now started. On the sides the Monday team continue to renew the panelling - pictures here and here . 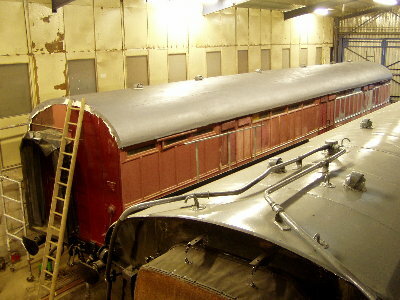 UPDATE - 12th DECEMBER 2004 - The new roof canvas was fitted as planned yesterday. The pictures show the bare roof ready for the canvas, the canvas half fitted (being rolled out and glued in sections of around 4ft at a time) and finally completed - just waiting for trimming to complete the job. The cantrail and end boarding will now be fitted, and then at least four coats of paint applied. Many thanks to the team of 10 volunteers who helped with this (difficult!) task. 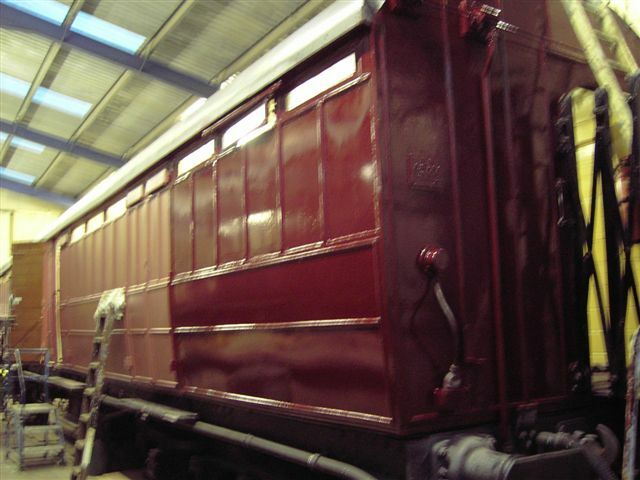 UPDATE - 18th DECEMBER 2004 - The canvas has now had two coats of paint, and the roof vents refitted. Photo. UPDATE - 24th JANUARY 2005 - The body overhaul on the tender has continued apace and the first sections received the gloss top coat on Saturday - photo here. Meanwhile the sorter has received further attention to the outstanding repanelling - photo. This should be completed next weekend allowing the exchange equipment to go back on. UPDATE - 20th FEBRUARY 2005 - The body overhaul on the Tender is nearing a conclusion, one side is now finished in gloss. 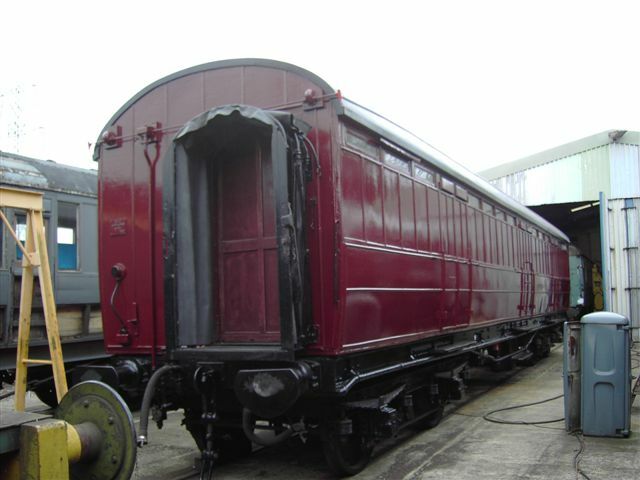 The corridor connection on this vehicle has now been renewed, and a new sets of brake hangers fitted. On the sorter beading has now started to be fitted and the damaged exchange equipment has been repaired and will be refitted shortly. 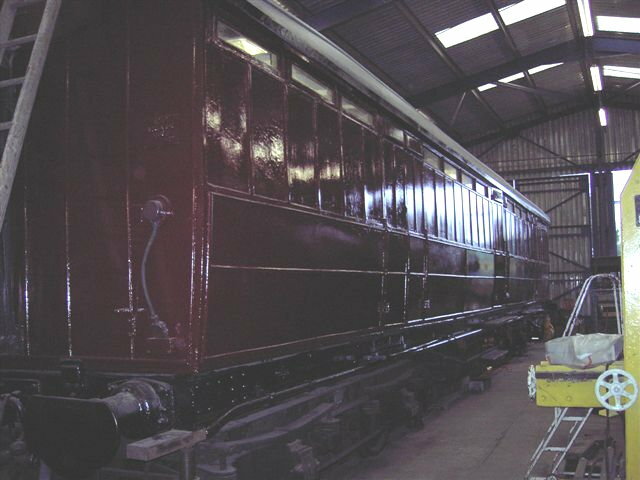 UPDATE - 27th MARCH 2005 - The tender has now had its second coat of gloss; a final coat of varnish has now been started. On the sorter the vaccum cylinders have been removed for overhaul, while the final section of beading has now been fitted. This allowed a final coat of varnish to be applied - although interrupted by rainfall. Work is now concentrated on the ends. The new corridor connection going on at one end and the ddamaged plywood at the other receiving attention. OUTSTANDING WORK - The following needs to be completed before the set re-enters service in the summer - Any offers of help are welcome, particularly during our end May / early June work week. 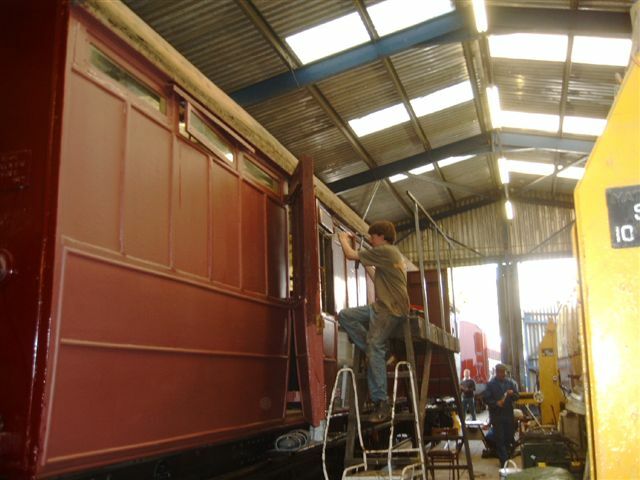 UPDATE - 10th April 2005 - The work on the tender exterior is now nearing completion. The end boarding on the roof has been fitted at the North end, with the other set made ready for fitting next week. A final coat of varnish will complete this vehicle (work then moving on to the interior). The sorter has seen a coat of gloss applied, unfortunatley interrupted by rain. Full finishing will follow shortly. The South end has seen extensive work and is now in undercoat. The corridor connection the other end has now been renewed. Refitting the exchange equipment has occupied several weekends, but is now nearing completion, with two traductor arms now fitted and the majority of the othr pair now in place. Some further adjustment and a test run will be needed before the set enters public service. 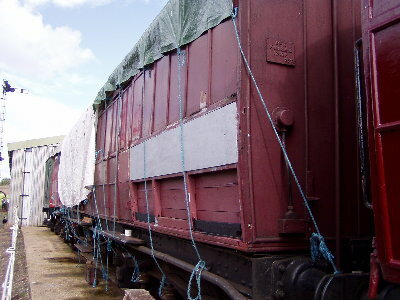 UPDATE - 25th April 2005 - The Tender is now externally finished and has been moved out of the shed - picture here. It has been replaced in the shed by the Sorter, which today had the brake hangers changed to remove much of the slack in the braking system. 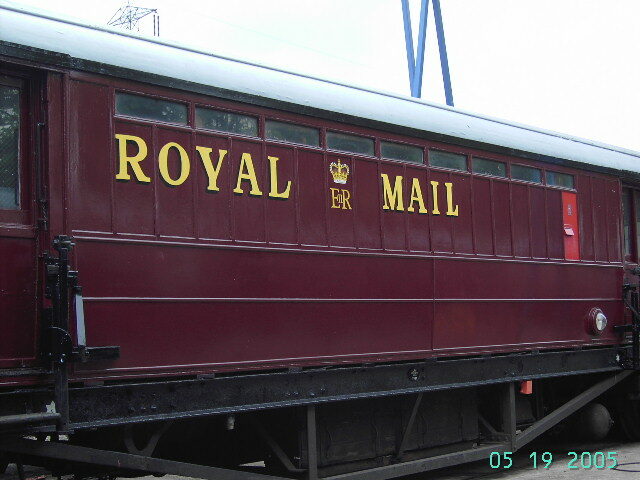 UPDATE - 22nd May 2005 - The exterior work on our LNER TPO set is now nearing completion, pictures here and here; the brake cylinders on Tender 70268E are the only significant outstanding outside. A general tidy up of the interior of 70294E is underway, more extensive work on the museum interior of 70268E will then follow. The first appearance on completion will actually be at the Nene Valley Railway. This is however a brief visit and the set will be operating on our home railway at the summer gala on 23/24th July.